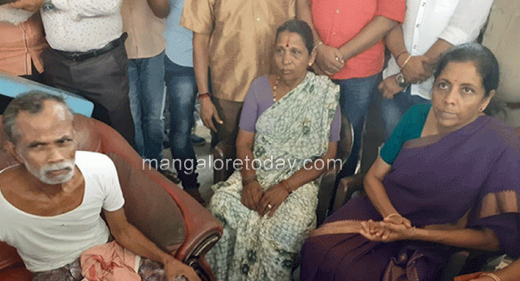 Malpe, Mar 26, 2019: Union Minister Nirmala Sitharaman on March 26, Tuesday visited the residences of two of the fishermen who were on board the missing Suvarna Tribhuja fishing boat which had ventured into fishing from Malpe in December last year. It may be recalled here that all seven fishermen on board the boat are missing. 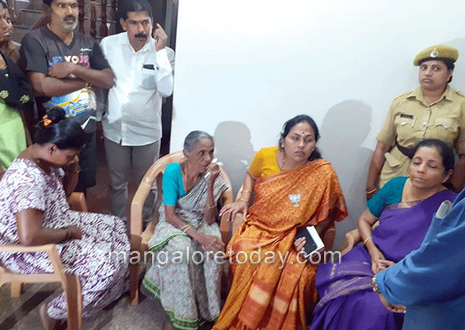 The defence minister visited the house of Chandrashekhar Kotian, the owner of the missing boat and Tandela Damodar Salian at Pavanjigudde near Badanidiyoor and consoled the family members. The Minister told the family members that the Maharashtra Government as well as the Indian Navy were still making all out efforts to trace the boat and the fishermen. Shobha who spoke on behalf of the Minister said the Navy has agreed to conduct a search in the place where the fishermen want to search for the missing boat. She also said all demands of the missing fishermen’s families have been accepted by the minister. MLAs Raghupathi Bhat, Lalaji Mendon, Malpe Fishermen’s Association President Satish Kunder and others were present.